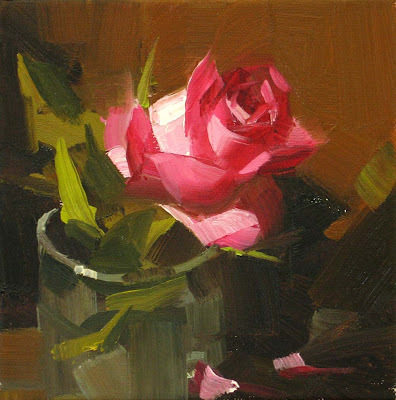 Painting flowers is very different from painting a vase or an apple. I can never use a portrait approach, but flowers do have their own anatomy. 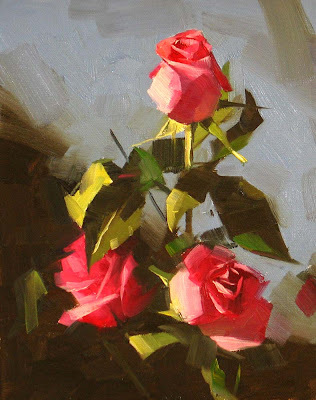 If you really understand this anatomy, painting flowers actually is easier than a vase or other more defined objects. Unfortunately, I am still working to achieve the understanding. So painting flowers is still hard for me. 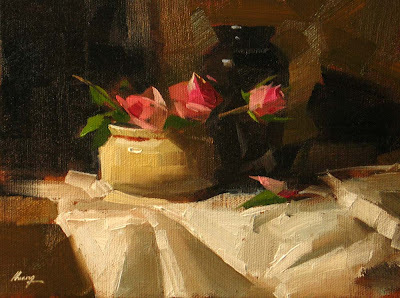 I will teach a 3-day workshop at Round Rock, TX this fall. Please contact: Denise Larue Mahlke at dlaruem@yahoo.com for detailed information. Denise is a very successful artist and a great teacher. 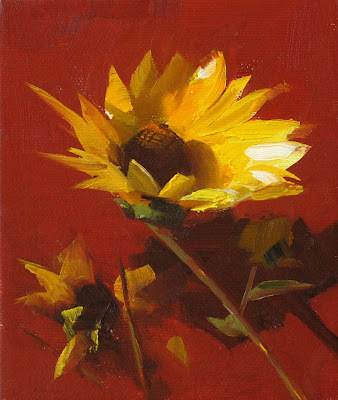 She was featured in the current issues of the American Artist and Southwest Art magazines. I hope these roses bring you some happiness today. I am behind my schedule again. I need to paint quite a few gallery paintings for several shows. For this painting, I am experimenting my new way of composing. Hope this effort can provide you a fresh look of my work. It is good but not easy to do something new. Be honest with you, I have run out subjects I really want to paint. 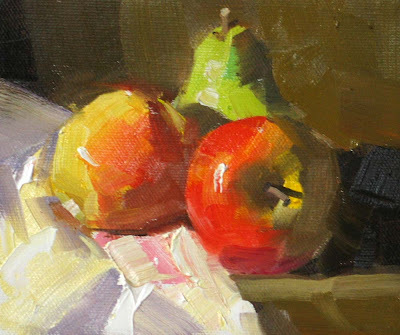 You know I like apples a lot, but I think I had painted too many of them. Last night, I was in my studio, looking at all my still life objects. None of them I really want to paint. This power drill was among the last things I wanted to look at. The reason I paint it was that I have never painted it before. But to my surprise, I kind of like it. Is it important that the onion has to be organic for a painting? I don't know. The real idea behind this painting is that I want to present two colors: green and purple. I may generate some disturbance here. Obviously, these are two very different colors. However, I consider these two have a similar color temperature. Generally speaking, it is hard to say which one is cooler or warmer. I have held this opinion for a long time, and I have openly spoken about this at my previous workshop. If you are a color theorist, I am very interested in your comment about this issue. 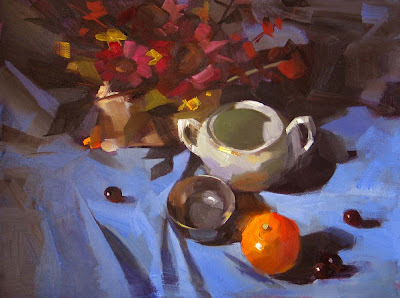 I am planning to teach a 4-day workshop at Bastrop TX from September 12 to September 15. Martin House – Crafter’s Haven, will organize this workshop. It will be hosted in a beautiful old Victorian mansion, built in 1888. Please contact Theresa at theresanavan@aol.com for detailed information. Thanks. I am back, finally. I tried to pick up my brush for a whole week, but I had no chance. Thank God today is the weekend. Now sunflowers are blooming, I see them every morning when I jog. The sunflower is strong. I am inspired by its vitality. 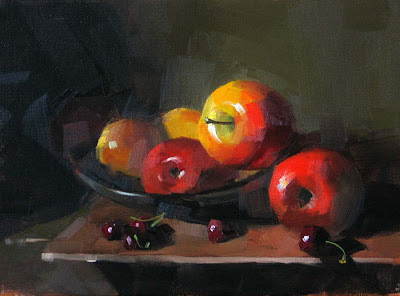 This is another demo painting I did at my workshop last weekend. I have not started painting since the workshop. Recently, my load at my engineering job has increased. 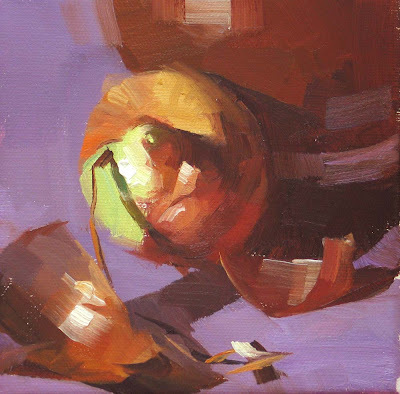 I have to admit that I have not been able to follow my daily painting discipline. 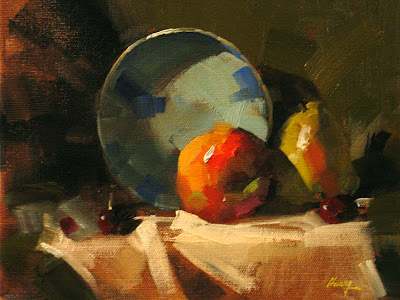 In this fast pace and exceedingly complicated modern life, being able to paint is an extraordinary luxury. Please do not take it for granted, and treasure your painting time, my friends. Last Friday and Saturday, I went to Magnolia, TX and did my third workshop of the year. I want to express my sincere gratitude to Marty Hatcher for organizing this event at the beautiful ARLC. I really enjoyed meeting new friends and seeing old friends in these wonderful two days. 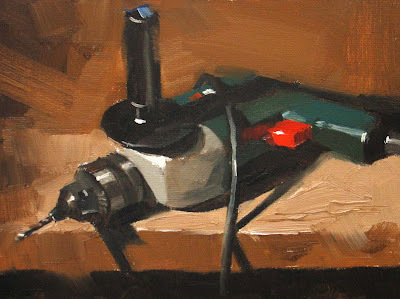 The painting I posted today is one of the demos I did. It combines both my left and right hands strokes. I hope all the attendees of this workshop have learned one or two new things. I am going to go back to ARLC in July to give another workshop and looking forward to meet more new friends. If you are interested in attending my future workshops at ARLC, please contact Marty. We will update you new workshop plans soon. Thanks very much to so many friends writing to me regarding my injured shoulder. It is getting a little better. The pain is less than before, and I started to stretch and hope it will be back to normal soon. In the mean time, I will keep practicing my left handed painting continuously. After my previous post, I have received many emails and comments from you. I am really really touched when I read your messages. Many of you shared similar experiences, and providing helpful tips and information of remedies. Thank you all very very much. I have started stretching and other exercises. At this moment, the pain is still with me, but I feel it is much more bearable now. Positively speaking, this painful experience did open up new avenues for art. I painted this painting 100% left-handed. I highly recommend that you give a try as well if you want to loose up. My clumsy left hand brought me some good surprises. Now and then, we have to face some challenges. For about month, I had problems with my right shoulder. It gives me a lot of pain and gradually frozen up. So I have to practising painting with my left hand. This painting and the previous one contain many my left hand strokes. As matter of fact, It is not that hard to paint left handed if you have a loose style.